Popcorn balls are the perfect treat for kids of any age! With this popcorn balls recipe, and some imagination, you can make them for any occasion. Add some pink or red food coloring, make them into heart shapes and you have beautiful Valentines treats! Red and green and you have the makings of awesome holiday popcorn balls. I have been holding out on you! Yep, there is a recipe that is part of our Christmas holiday tradition that I have not shared with you – my Popcorn Balls recipe! So, I’m fessing up now – confession is good for the soul – right? Be sure to watch the video to see how easy they are to make and review the list of tips for making popcorn balls. 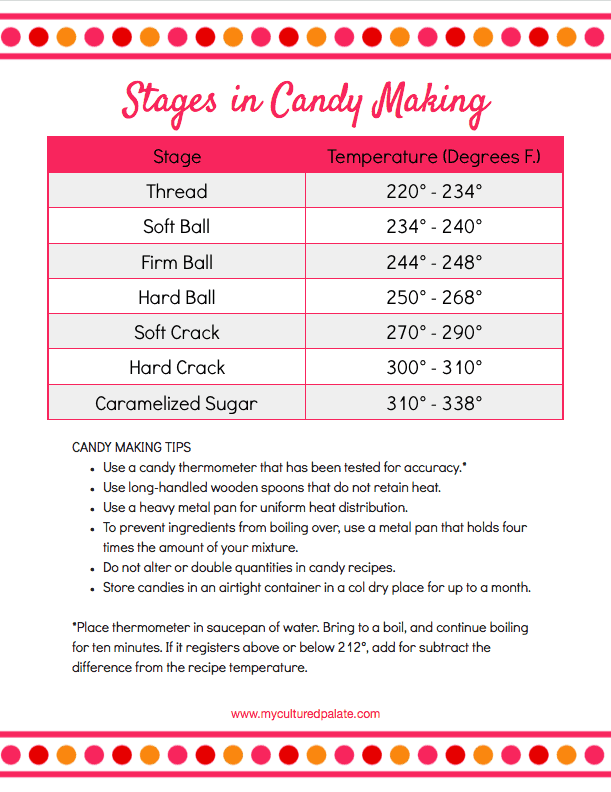 There is also a free printable for you that gives the temperatures for candy making! 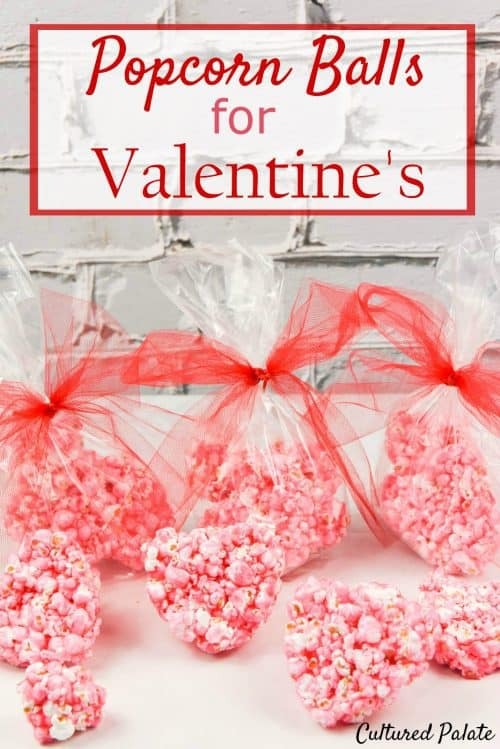 Much to my children’s pleasure, this year, I used our popcorn ball recipes and made popcorn balls as part of our Valentine’s Day festivities in the form of red and pink hearts. If you are looking for a treat that kids of all ages will love, popcorn balls are the answer! I’m not kidding – the children all love making them! And, of course, eating them! Like I said earlier, we normally have popcorn balls at Christmas time and use red, green and blue food coloring. But, they are not just for Christmas! They can be for any occasion you are celebrating. That is the neat thing about popcorn balls, you can add whatever food coloring you desire, shape them into any form and voila – you have the perfect festive treat! If you are afraid of making popcorn balls because of the different stages the sugar goes through, I have something to help! Here is a free printable that gives the temperatures for the stages that the sugar goes through. You can click on the image and you will be taken to a pdf to download it or there is a link at the bottom that you can also click to be take to the pdf, download and print. Now, there is no need to be put off by a popcorn ball recipe or any other candy recipe! You have the temperatures to look at on the chart and that is what I use. No more dropping the hot sugar in a cup of water and trying to form it and determine which stage it is in. I don’t know if you have ever tried shaping hot sugar to tell if it is at the soft ball or hard ball stage, not to mention, the soft crack, but I could never quite get it! If you are looking for an inexpensive gift that involves some love, try making this popcorn ball recipe into shapes for the holiday or occasion being celebrated. Any color or shape popcorn balls can be made to fit the occasion. 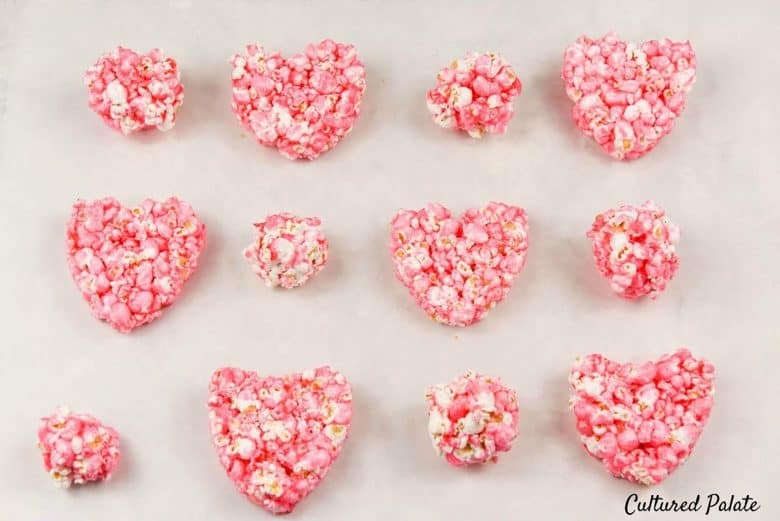 For Valentine’s Day make popcorn ball hearts like you see in the video above. Place them in clear bags, add a red (or pink) ribbon and you’re covered! You can do it for any shape, color and occasion. These clear bags are good and available in different sizes. John made several heart shaped cookie cutters from metal cans that I had used. Once the popcorn was covered with the sugar syrup, we pushed the popcorn into the cookie cutters. They worked great! Imagine the shapes that can be made from candied popcorn! WOOWWW, the world of possibilities is just sooo exciting! Pop your popcorn first and have it ready. The syrup should be poured over the popcorn immediately before it cools. Sugar syrup is VERY hot – remember, you just had it boiling. Be careful when making popcorn balls with small children – it will burn! Use butter or oil and rub on your hands before handling the candied popcorn to prevent burning – don’t skip this step! Allow the candied popcorn to cool slightly before shaping. If the candied popcorn cools too much, it will not stick together so work quickly! Press into a two part cake mold – be sure to oil the mold first so your masterpiece comes out easily and beeeauuuutiful! We normally just make balls but the popcorn ball hearts are so much fun to make I am sure we will try other shapes. And, there is always the discussion about how big the popcorn balls should be – using a mold stops the controversy! When working with the candied popcorn, please remember that it is extremely hot and can cause burns. This is particularly important when making them with small children. Don’t let this keep you from making them though – children love it! We have made popcorn balls using this same popcorn ball recipe with our children since they were small and no one has been burned. I have always used olive oil but you can also use butter or another type of oil. The following popcorn balls recipe can easily be doubled, tripled and quadrupled. When making larger batches, be sure to have enough helpers to shape the popcorn before it cools too much! Otherwise, your popcorn balls recipe will still taste good it just won’t be shapeable. If you’ve tried this Popcorn Balls recipe or any other recipe on Cultured Palate please take a minute to rate the recipe and leave a comment letting me know how you liked it. I love hearing from you! You can also FOLLOW ME on PINTEREST, FACEBOOK, INSTAGRAM, YouTube and TWITTER. 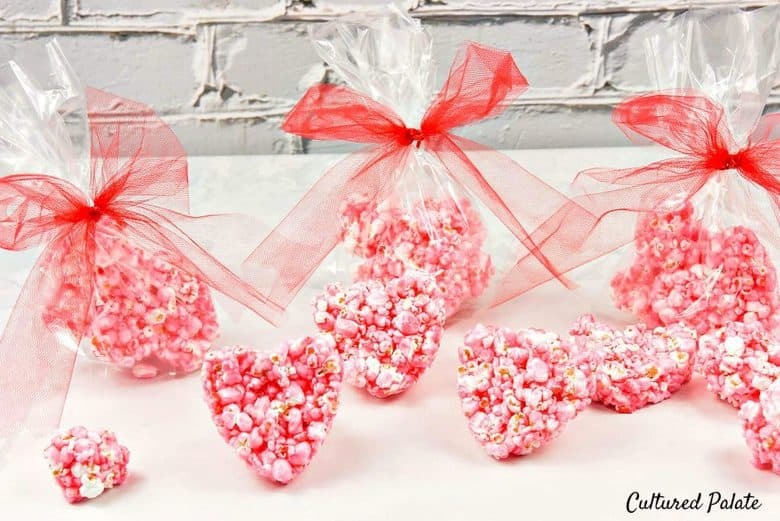 Popcorn Balls delight children of all ages and what could be better than pink and red popcorn balls made into hearts! Pop popcorn and place in a large bowl - set aside. Mix all ingredients in a boiler and bring to a boil. Cook covered until the steam washes down the sides of the pan - normally 3 - 5 minutes. Remove lid and cook until the temperature reaches about 290F - Do Not Stir. If the mixture begins to yellow, remove from heat and continue with step #5. Remove from heat and add food coloring - stir well. Pour slowly over the popcorn stirring to coat. Using oil or butter, cover hands with oil to prevent burning and carefully shape the popcorn into desired shapes. Popcorn balls can be shaped with your hands to form balls, pressed into cookie cutters or pressed into a two part cake mold to produce the desired shape. This recipe can be easily doubled, tripled, quadrupled...just be sure when making large batches there are enough helpers to shape before it cools too much. These are the cutest sweet treats ever, so perfect for Valentine’s. I think I’ll always make them heart shaped even at Christmas time haha.